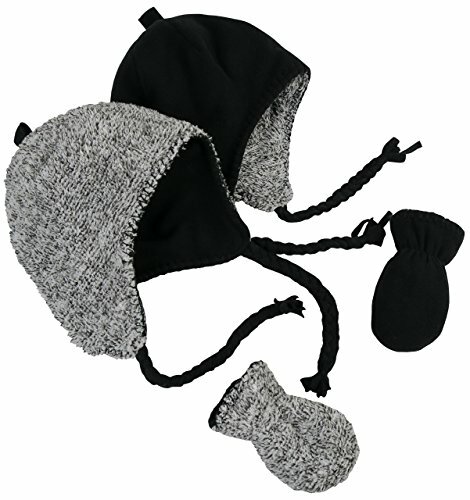 N'ice Caps Little Kids and Infants Fully Reversible Hat with Reversible Mittens Fleece and Sherpa Skater Set. Both the hat and mittens are fully reversible. Hat and mittens are either double sided fleece, or fleece with reversible soft sherpa (as pictured). Mittens have elastic under wrists for easy-on wear. Color options: black solid fleece/black-white sherpa; navy fleece/royal checker fleece; grey camo fleece/black-white sherpa; black solid fleece/red checker fleece; black/fuchsia. 4 sizes available: 3-6 months, 6-18 months, 2-3 years, 3-6 years. For infant sizes up to 18 months, the mittens do not have thumbs. For the larger sizes 2-3 years and 4-7 years, the mittens have thumbs. Tested and approved as per CPSIA standards.